cross training | We RUN USA !!! I have been a goal setter and goal planner for a long time. In my younger life my goals..or my written goals were almost exclusively sports , athletics and physically related. A few examples included improvements specific stats in a sports situation or reaching a target weightlifting maximum during offseason workouts. There were some goals in other settings, usually academic but they were barely written done and if so, the details and plans were limited to the target accomplishment but with limited details about the work required. Later in life I wrote out some goals and even accomplished them. This was limited in scope and success. I have now created a broad set of goals and my current health/ physical goals have taken on a new importance. The March 2017 diagnosis of HEART FAILURE, created an urgency that a “generic” weight loss / GET FIT goal may not have. Doctors have suggested diet recommendations and limitations as well as some exercise, they have agreed to my general plan of getting back into shape as I drop weight and move towards a physical situation that is most healthy. My physical goals include a variety of the following…. Time to get to the gym, us ether elliptical, now,that I can, and work on the tower and bike as well. This is a little bit of fun with the words as I continue my journey to recovery from heart failure and creation of a fit and healthy body. Walks are increasing to 5 per week and time/ distance is also growing. The play with the title is the fact that I am about to walk a mile. I have been mixing up walks of .25, .55 and up to .79 miles so far. One day this week I should cross the mile marker in a workout. This will also be the walk of longest duration. Future plans include daily walks alternating 30-40 minutes with workouts of 50-70 minutes. As I get more fit, lose the weight and strengthen my knees I hope to add miles and once a week go,for a personal best distance and eventually…..RUNNING. 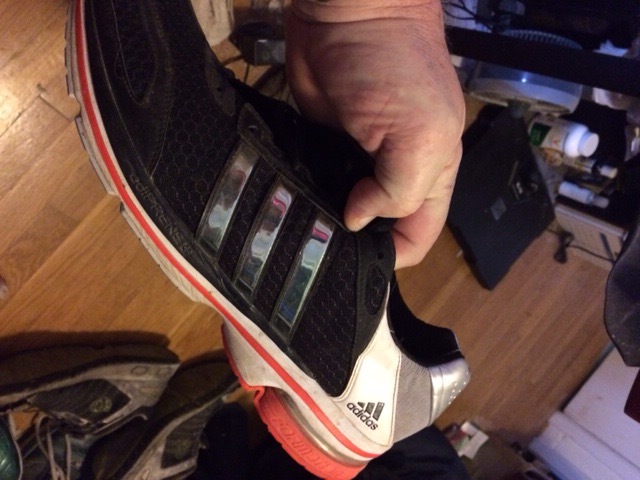 Break out new runners and get going…Of course I am walking in these and will run in them as well. I have also felt and increase in strength for my legs as I have been doing a few sets of squats . I will add step ups, and lunges. Now to,get back to work and have a good eating day.